Sizable shares of Americans say that those with views different from their own about how Donald Trump is handling his job as president also probably don’t share many of their other values and goals. Just over half (54%) of the public disapproves of the job Trump is doing, while fewer (39%) say they approve of his job performance, according to a new Pew Research Center survey conducted March 7-14. Trump’s job ratings have changed little since the start of the year. Among those who disapprove of Trump – the larger share of the overall public – 56% say that those who approve of him probably do not share their other values and goals; fewer (39%) say that they probably do. There are partisan and demographic differences in views on this question among both Trump approvers and disapprovers. Among those who disapprove of Trump, 65% of self-identified Democrats say they don’t think those with a different view of Trump share their other values and goals. 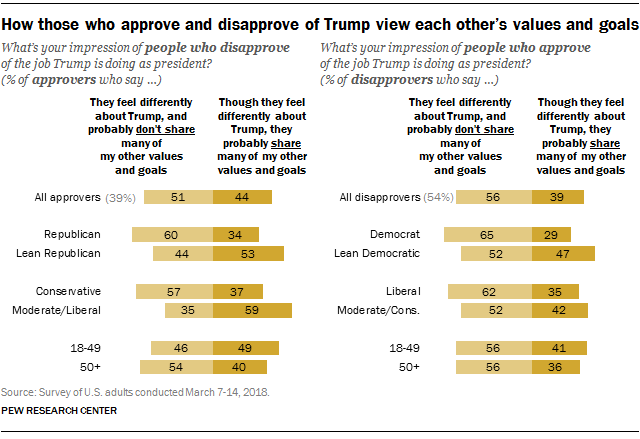 Among those who disapprove of Trump and lean toward the Democratic Party (but don’t identify with it), views are more mixed: 47% think those with a different view of Trump probably share many of their other values and goals, while 52% think they probably do not. Similarly, among those who disapprove of Trump, liberals (62%) are more likely than conservatives and moderates (52%) to say those who take a different view of Trump probably also do not share many of their other values and goals. Opinion patterns among those who approve of Trump largely mirror those seen among disapprovers. By 60%-34%, self-identified Republicans who approve of Trump say those with a different view of him probably do not share their other values and goals. Among those who lean toward the Republican Party and approve of Trump, 53% think those with a different view of him probably share many of their other values and goals, compared with 44% who say they probably don’t. The current question, which focuses on views of Trump, elicits a somewhat different pattern of response than a related question, asked in 2017, which focused on political affiliation. Last July, most Democrats (59%) and Republicans (56%) said they felt that even though members of the other party felt differently about politics, they probably shared many of their other values and goals. 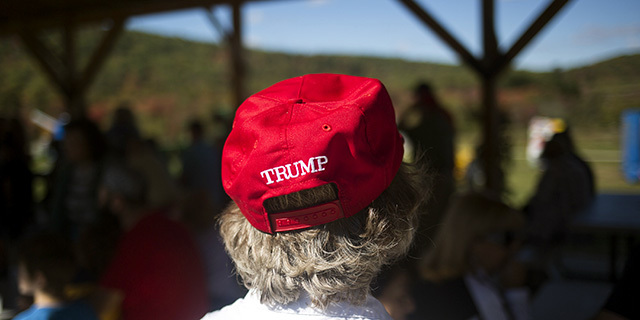 The current question, which asks about differences outside of views of Trump – not politics more broadly – finds less widespread perceptions of common ground. There continue to be demographic differences by gender, race, education and religious affiliation in Trump’s overall approval ratings. Currently, whites remain divided in their views of Trump: Half (50%) approve of the job Trump is doing as president, while 45% disapprove. Blacks (85%) and Hispanics (74%) overwhelmingly disapprove of Trump’s job performance. Wide differences in views of Trump by educational attainment also persist. By 71% to 26%, those with a postgraduate degree disapprove more than approve of Trump’s performance. Similarly, nearly two-thirds of those with a bachelor’s degree (64%) disapprove. Note: See full topline results (PDF, CSV) and methodology here (PDF).